Wanting to help his customers unlock greater potential from their soils, one Leicestershire contractor has invested in direct drilling. Geoff Ashcroft reports. With its 6m Sky EasyDrill, RAC Contractors is looking to stimulate soil health for its customers as a result of direct drilling. Based at Villiers Farm, Melton Mowbray, R.A.C. Contractors operates a contract fertiliser spreading business which sees about 20,000 hectares (49,421 acres) covered each season. 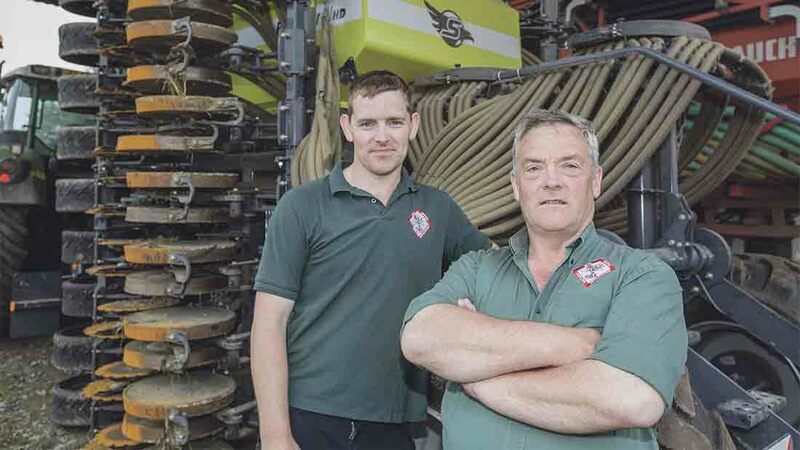 Run by Richard Chandler and son James, the two have developed a keen eye for doing the job as accurately and efficiently as possible. It is an approach which sees soil analysis and nutrient application carried out with an almost unhealthy obsession for detail. Richard Chandler (right) and son James are conducting trials on their own land to assess how the EasyDrill might benefit soil structure. It is a focus which has led the business towards offering a direct drilling service using a Sky Agriculture EasyDrill imported through Opico. "Farming is not always about maximum yield. 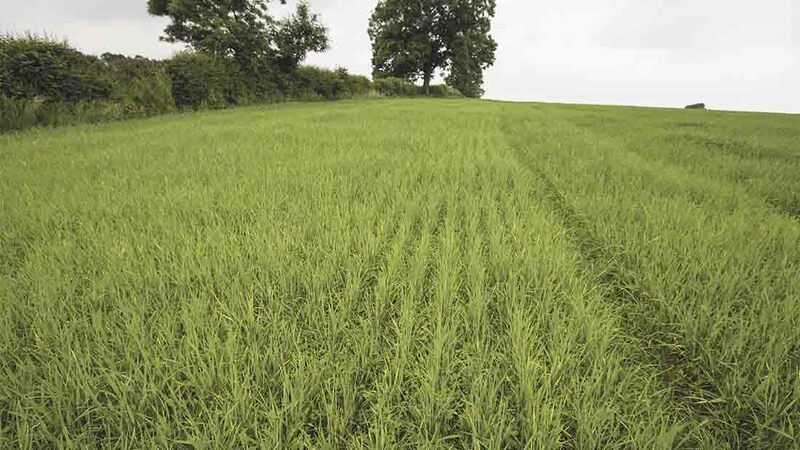 It is about making the most of all your resources, above and below ground"
He believes the first step towards improving soil health is to consider direct drilling and cover crops, to help soils improve their condition. “The more we move soil, the more we encourage the wrong things to grow, and the only means of control is with sprays,” he says. “To help the soil to repair itself, we need to tread lightly and not move soil unnecessarily. 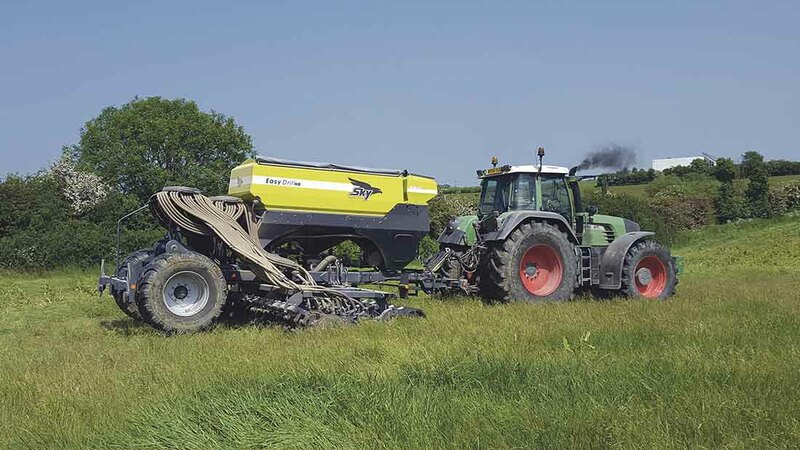 The shift into direct drilling followed last winter after Mr Chandler attended a seminar which got him thinking about micronutrients, biodiversity and naturally-occurring soil bacteria. 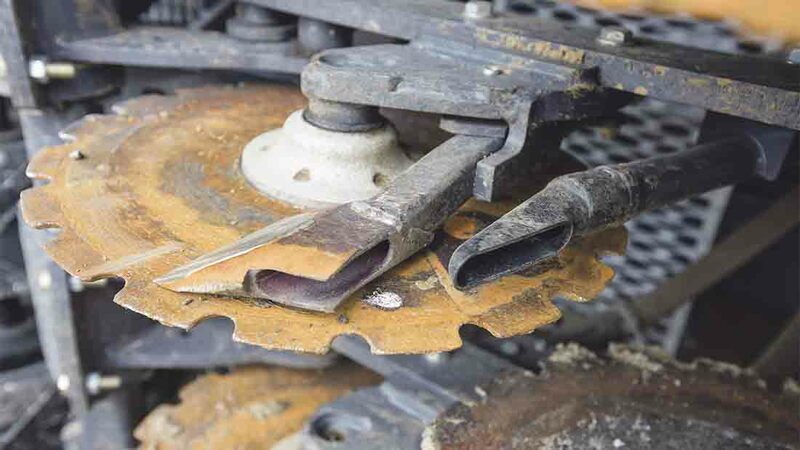 Disc coulters run at a 3.5-degree angle to open a seed slot and minimise soil movement. “It struck a chord with what we already do,” he says. “The direct drilling principle supports our way of thinking. It has made me believe we, as a nation of farmers, need to look at ways of improving soil health and soil structure. “Unfortunately, we have become a little too reliant on chemicals, because we have taken a simplistic approach to rotation to pursue yield at all cost, but I believe there is a better, more efficient way to get greater value from soil, with the potential to cut chemical expenditure by up to 50 per cent. His attention was drawn to the Sky Agriculture EasyDrill and a demonstration for the 2016 spring plating campaign was initially planned. But he says there was so much interest from customers they bought a six-metre version without a demonstration, using the machine to complete 150ha (370 acres) of spring drilling earlier this year. Having spent the best part of £100,000 on an all-new drill system, a 10-year old Fendt 924 provided tractive power for the new establishment system. “We were told we did not need so much horsepower, but soils around here are hard and heavy. It needs a bit of pulling, particularly in wet spring conditions on banks and into trash. Mr Chandler has particular praise for the even germination which followed in what has been noted as a less than an ideal spring. According to son James, the drill offers numerous crop establishment options. Three hoppers and twin outlets allow combination of seed, fertiliser and/or slug pellets to be applied. 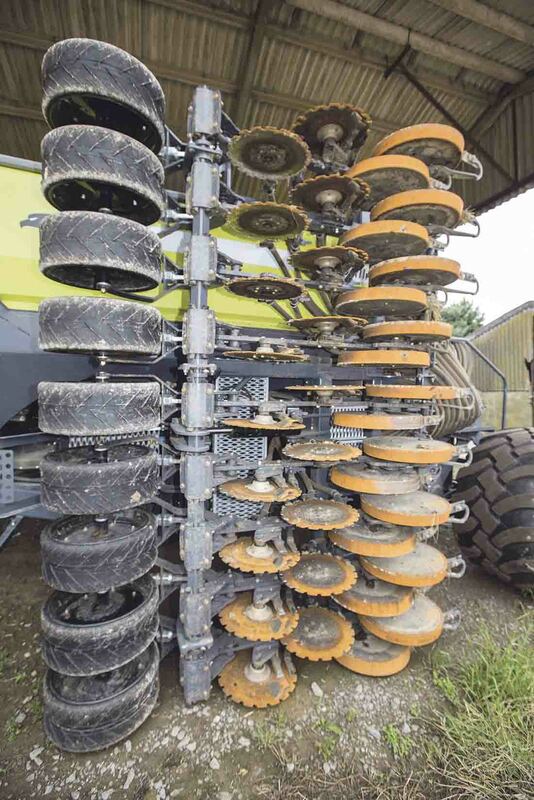 While the EasyDrill is predominantly aimed at direct drilling, the French maker says it is also suitable for use with plough-based and min-till systems. “Dad and I keep bouncing ideas off each other but at the end of the day, the system has to be practical,” says James. 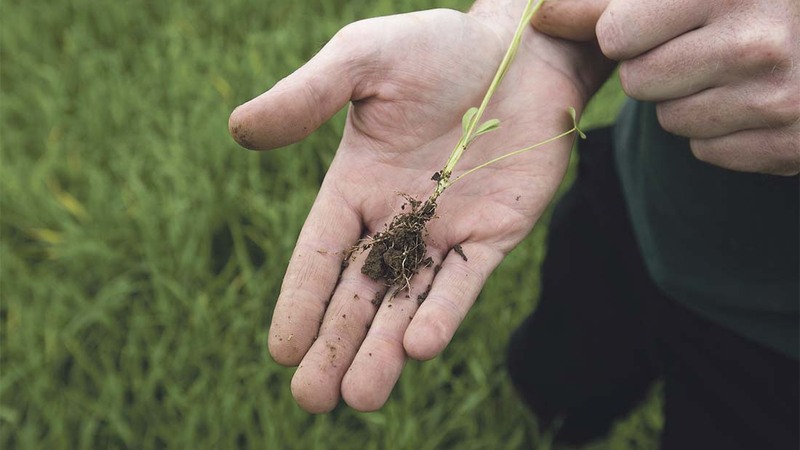 “We have the potential to put organic matter and nitrogen back into soils, the latter through under-sown clover or lucerne. And we are working with a customer who was not sure what to do with a couple of fields in the spring, but we are using his field to see how black oats and crimson clover might benefit soil type. Nodes are clearly visible, which means a ready supply of nitrogen will soon be available through the soil for successive crops. James says the drill has so far worked well and it is easy to set up and calibrate. “Hydraulics for lift and lower have proved a bit slow, so I have set a headland sequence to lift the front of the drill on the linkage-mounted drawbar to speed this up at the headland. While it is early days for R.A.C. Contractors’ new drilling service, the firm is clearly enthusiastic about the potential to improve customers’ soil health through direct drilling. Simultaneous sowing of spring barley through the coulters and clover down the tubes at Villiers Farm. Richard says: “We are on our way to finding cost-effective and efficient ways of injecting life into numb soils which have been beaten into submission in pursuit of yields while attempting to control grass weeds. “Better soil health and biodiversity will help profitability in the long-term,” he says.